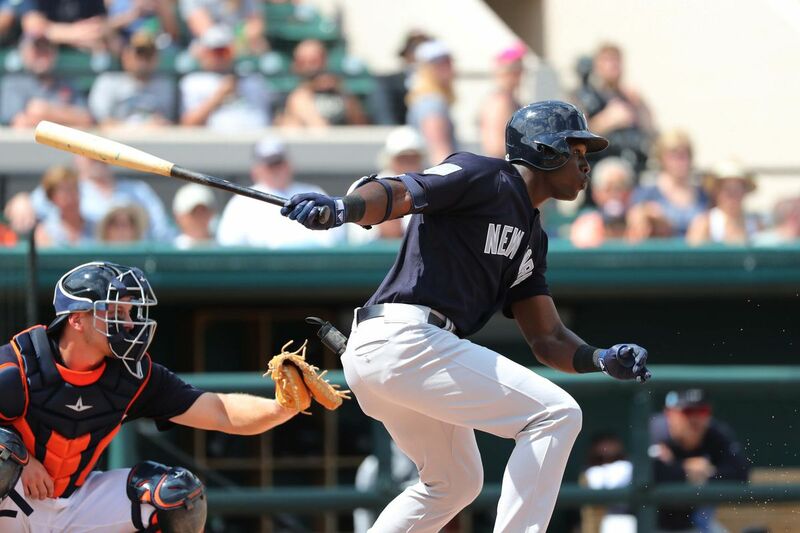 What could these top prospects look like a few years down the road in pinstripes? Projecting prospects is generally more of an art than a science. There’s no telling what adjustments a player might make successfully over their years in the minor leagues. The best way to project a prospect is often just to visualize a player that has made his way to the major leagues with a similar set of tools and a style of play that reflects that of the prospect. So, with that in mind, I took a crack at some comparisons for three of the top prospects in the Yankees system. Schmidt, a right-handed pitcher, is the Yankees’ fifth overall prospect according to MLB.com. Although he was only a month removed from Tommy John surgery, his impressive four-pitch mix proved enough for the Yankees to select him in the first round of the 2017 draft. Schmidt spent nearly the entire 2018 season rehabbing his injured right elbow, but has come out of the gates strong in Class-A Advanced to begin 2019. Schmidt’s overall delivery and repertoire are similar to Roy Oswalt, a former All-Star with 163 wins and a career 3.36 ERA. At six-foot-one and 200 pounds, Schmidt has a slightly larger frame than the six-foot, 190 pounds Oswalt, but they both throw from a similar arm slot, with their arm trailing their body slightly enough to create some deception. Schmidt throws his fastball in the 92-95 mph range and his slider in the mid-80s, much like Oswalt in the prime of his career. If Schmidt can remain healthy and improve his command to anywhere near the level Oswalt used to possess, he’ll have a bright future in the middle of the Yankees’ starting rotation. However, Oswalt was one of the most accurate pitchers of his era, so the Yankees would likely settle for a slightly more erratic version. This might not be the most lofty comparison for Florial, but the young outfielder is reminiscent of Alejandro De Aza, who played for ten years from 2007-2017. Florial, the Yankees’ top prospect, certainly has a higher ceiling than De Aza, but you could also do worse as an MLB player. The major difference here is that Florial’s tools are more explosive and he projects as a better defensive player than De Aza ever was. De Aza’s 2013 season in Chicago — his best year in the league — could be a sample of what Florial might look like as an MLB player. He batted .264, hit 17 home runs, and stole 20 bases that year. De Aza’s contact skills were never quite good enough to hit for a high average, which limited his upside, something scouts have said about Florial in recent years. However, De Aza was still a 2.5 WAR player in his prime, according to FanGraphs. Add some increased range and a strong arm to that kind of production and the Yankees could have a very solid everyday outfielder in Florial by 2021 or so. Gary Sanchez would appear to be the catcher of the Yankees present and future, but the team wasn’t shy about adding some organizational depth at the position in the 2018 MLB draft. The Yankees selected Seigler, a switch-hitting (and throwing) catcher from Cartersville High School, with the 23rd overall pick. They added another catcher, Josh Breaux, in the second round. It’s hard to hear “Yankees switch-hitting catcher” and not think of Jorge Posada, but there’s more to that comparison than just their ambidexterity. Seigler is a bit smaller and more agile than Posada ever was, but Seigler has shown a similar approach in his early transition from high school to the pros. He posted 14 walks and only 12 strikeouts in his first 24 games in the Rookie League last season. Those are early signs of the contact skills and plate discipline that made Posada such a great major league hitter. Posada had 30 home run power in his prime, so Seigler has a lot of catching up to do in that regard, but he’s only 19 years old. That makes it difficult to project his power output, especially if he plays home games at Yankee Stadium one day. Yankees to place Aaron Judge on injured list, call up Thairo Estrada The star right fielder suffered an oblique injury in Saturday afternoon’s game. Yankees vs. Royals: James Paxton vs. Jorge Lopez Can the Yankees pick up a series win against the Royals?